On Saturday, October 27, 2018 from 10:00 am to 2:00 pm, you have the opportunity to bring your unused prescription drugs to our collection site at the Hayward Police Department, 300 W. Winton Avenue, Hayward, CA 94544. Keep them safe. Clean them out. Take them back. 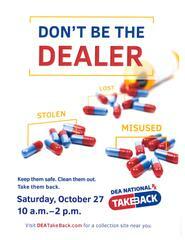 The DEA’s Take Back Day events provide an opportunity for communities to prevent drug addiction and overdose deaths.